The 2017 Bristol Guitar show will be the first guitar show in recent years to hit the South West UK. And that’s pretty insane given the fact that South West is home to both Guitar & Bass and Guitarist magazines, as well as a handful of highly regarded British brands. With the popular Birmingham Guitar Show not too distant a memory, though, we were wondering what the Bristol show will offer and what makes it really unique. So we spoke to Guitar & Bass editor and South West native Chris Vinnicombe and event organiser Ken Dixon about a few reasons you might want to make the trip. You’ll support the South West’s return to the guitar show calendar. "Growing up in Wales it often felt like events such as this were distant and inaccessible, so I think it's hugely positive to see a Guitar Show in the region with the support of major industry players." — Chris Vinnicombe. You have to rewind to 2010–2013 for the last major guitar show in the South West, and that was a different time for guitar shows. Once dominated by the big brands peddling the same gear at all the shows, lately we’ve seen a revival of guitar shows in the UK with a more open vibe: more handmade guitars from builders, innovative effects pedals from small British start–up brands, and a resurgence in both collectible and player-grade vintage gear. To put things into perspective, trawl back through Chappers’s YouTube archives and find a video of him at the 2010 Bristol Guitar Show playing Jaden Rose guitars back when Chapman Guitars were still more or less a twinkle in his eye! There’s going to be a huge variety of activities. Aside from the obvious slew of shops and exhibitors selling new and vintage guitars, there will be live performances throughout the day, masterclasses and workshops from Stuart Ryan of Guitar Techniques magazine, and even a book signing by Tony Bacon, the legendary author of over 30 books about vintage guitars. Ken also told us there would be more giveaway prizes than any other guitar show this year, with guitars, amps, effects pedals, and even mag subscriptions up for grabs for lucky event goers. It’s dirt cheap to get in (and kids under 12 go free). At only £7 for adults, it’s fantastic value. If there’s one thing UK guitar shows are known for, it’s great deals. So you’ll undoubtedly make your money back on a barmy bargain on a new (or vintage) guitar, amp, or effects pedal. It’s in a beautiful new venue. Hosted in the newly developed Aston Gate Stadium (sorry Rover fans), the Bristol Guitar Show will benefit from the South Concourse’s bright and modern exhibition hall, as well as a dedicated live performance area. It’s a welcome break from the charming British tradition of holding guitar shows in cramped town halls. No word on whether the catering will match the lofty standards of Vintage Veenendaal 2017, but we’ll let you know. The next guitar show in the area is not until October. Unless you’re willing to factor a road trip into your guitar show plans, you’ll be waiting until the weather turns cold again before another major guitar show happens in the south. And even that requires a trip to greater London. So get your guitar show fix while you can (that said, we do highly recommend you come to the Fuzz Guitar Show in Gothenburg next month if you can manage it). Reverb’s Mark Johnson will be at the event, so look out for him (in a black Reverb T–shirt) as well as Reverb sellers Atoyboy Guitars, Apex Music and The Little Guitar Shop. You can also check out Chickenbone John, Fredric Effects, Standby Guitars, and Drewman Guitars. 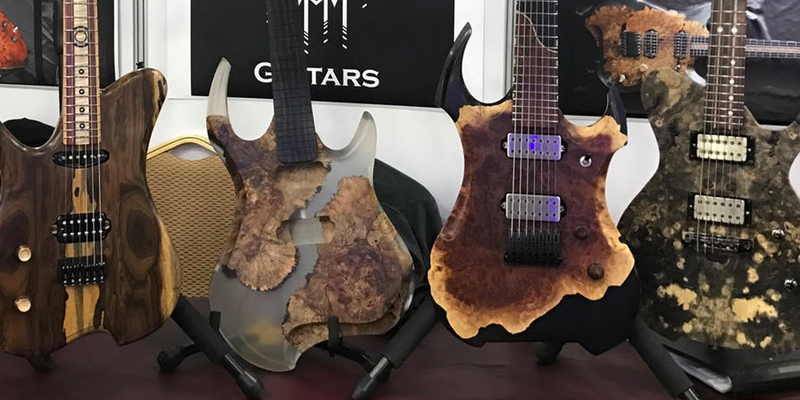 Here's what caught our eye at one of the largest guitar shows in the UK. 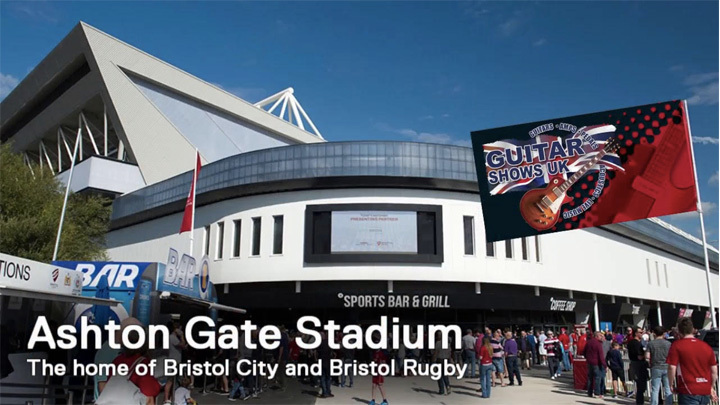 The Bristol Guitar Show will be held at Aston Gate Stadium in Bristol on the 30th of April 2017. Tickets are on-the-door only priced £7 for adults and free for children under 12 accompanying paying adults. Doors open at 10 am and the show finishes at 4 pm.